Gilbert Price is a Senior Lecturer in Palaeontology at The University of Queensland. He is a vertebrate palaeoecologist and geochronologist, particularly interested in the evolution and emergence of our planet’s unique ecosystems and fauna, and their response to prehistoric climatic changes. 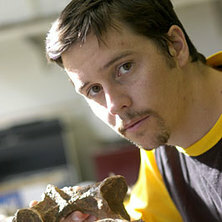 His major research focus has been on the development of palaeoecological models for Australia’s Cenozoic, especially the Quaternary megafauna. Critically, this also involves the production of reliably-dated records for the fossils that he studies. You can follow Gilbert on Twitter (@TheFatWombat) and read his reserach blog at www.diprotodon.com. Gilbert’s research is on track to have major impacts on and beyond the challenge of understanding megafaunal extinctions. His multidisciplinary studies span a wide breadth of distinctive research fields that include palaeoecology, geochronology, zoology and modern conservation. He already has and should continue to produce many more important, insightful publications that will significantly advance these fields as he continues to attract, and work with, a diverse range of national and international collaborators. The broad conclusions he is developing about the relationships between deep-time regional climate change and significant impacts on biodiversity have immediate relevance to some of the most worrying aspects of contemporary climate change. The application of geochemical analyses to interpret the diagenetic history and provenance of fossilised remains from Australia. Price, Gilbert (2015). Darling Downs. In Alex Cook and Andrew Rozefelds (Ed. ), In search of ancient Queensland: a Queensland Museum discovery guide (pp. 242-248) Brisbane, QLD, Austalia: Australia Queensland Museum. Price, G. J. (2013). Quaternary. In Peter A. Jell (Ed. ), Geology of Queensland (pp. 653-685) Brisbane, QLD, Australia: Geological Survey of Queensland. Price, Gilbert J. (2012). Long-term trends in lineage ‘health’ of the Australian Koala (Mammalia:Phascolarctidae): using paleo-diversity to prioritize species for conservation. In Julien Louys (Ed. ), Paleontology in ecology and conservation (pp. 171-192) Berlin, Germany: Springer. The identification of extinct megafauna in rock art using geometric morphometrics: A Genyornis newtoni painting in Arnhem Land, northern Australia? Price, Gilbert (2017, September 27). Giant marsupials once migrated across an Australian Ice Age landscape. , . Is the thylacine really extinct? Price, Gilbert (2017) Is the thylacine really extinct?. UQ website, University of Queensland. Price, Gilbert (2016) The hammer that shaped a university. UQ website, University of Queensland. What happened to Australia’s Ice Age megafauna? Price, Gilbert (2016) What happened to Australia’s Ice Age megafauna?. UQ website, University of Queensland. Price, Gilbert (2016) The Ice Age lizards of Oz. Australasian Science, 37 3: 20-23. Price, Gilbert (2014) Bare bones. SpineOut, 22 (Jun-Jul): . Price, Gilbert and Wood, Emily (2014) Undara: a legacy in lava. AAOD Journal, 11 1: 36-51. Sobbe, Ian H., Price, Gilbert J. and Knezour, Robert A. (2013) A ziphodont crocodile from the late Pleistocene King Creek catchment, Darling Downs, Queensland. Memoirs of the Queensland Museum - Nature, 56 2: 601-606. Recent massive coral mortality events in the South China Sea: was global warming and ENSO variability responsible? Price, Gilbert J. (2012) Plio-pleistocene climate and faunal change in central Australia. Episodes, 35 1: 160-165. Price, G. J. (2008) Taxonomy and palaeobiology of the largest-ever marsupial, Diprotodon Owen, 1838 (Diprotodontidae, Marsupialia). Zoological Journal of Linnean Society, 153 2: 389-417. Price, Gilbert J. and Sobbe, Ian H. (2005) Pleistocene Palaeoecology and Environmental Change on the Darling Downs, Southeastern Queensland, Australia. Memoirs of the Queensland Museum, 51 1: 171-201. Price, G. J. and Hocknull, S. A. (2005) A small adult Palorchestes (Marsupialia, Palorchestidae) from the Pleistocene of the Darling Downs, southeast Queensland. Memoirs of the Queensland Museum, 51 1: 202-202. Price, Gilbert J. (2002) Perameles sobbei, sp. nov. (Marsupialia, Peramelidae), a Pleistocene bandicoot from the Darling Downs, south-eastern Queensland. Memoirs of the Queensland Museum, 48 193-197. Louys, Julien, Price, Gilbert J., Zaim, Jahdi, Rizal, Yan, Santoso, Wahyu D. and Trihascaryo, Agus (2017). Geochronology and palaeoecological implications of new orangutan-bearing fossil deposits from the Padang Highlands, western Sumatra. In: 86th Annual Meeting of the American-Association-of-Physical-Anthropologists (AAPA), New Orleans LA, United States, (267-267). Apr 19-22, 2017. Price, Gilbert J., Cramb, Jonathan, Louys, Julien and Feng, Yue-xing (2017). Palaeontology of northeastern Australian caves. In: Kevin Moore and Susan White, Proceedings of the 17th International Congress of Speleology. 17th International Congress of Speleology, Sydney, Australia, (25-28). 22-28 July 2017.